Apple is reported to be moving from LCD to active matrix organic LED (AMOLED) for its next iPhone 8 smart phone series. As of now Samsung is said to be the vendor selected by Apple to supply AMOLED , although LG stands as best competitor to Samsung as alternate supplier to Apple. AMOLED is already used in smart phones made by Samsung, Apple is a late user of AMOLED display panels. 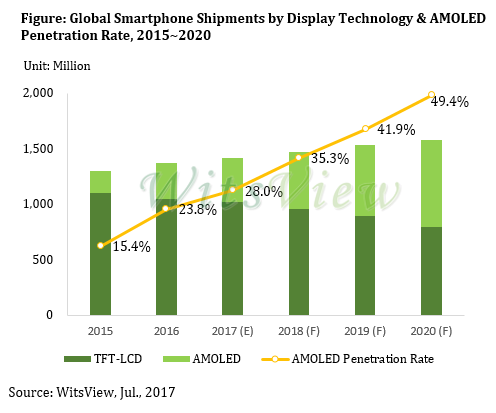 The market researcher WitsView, a division of TrendForce forecasts with the Apple going for AMOLED, AMOLED to become a mainstream display technology for smart phones where it expects nearly 50% of the smartphones to have AMOLED by 2020. Apple selection of Samsung's AMOLED LCD panel to trigger increased activity of AMOLED manufacturing in Asia and more so in China. WitsView says "Chinese panel makers EverDisplay (EDO) and Visionox entered the AMOLED market early on during the 2013 to 2014 period. Later in 2016, the much larger Chinese panel suppliers BOE Technology (BOE) and Tianma also made the switch from focusing on the production of LTPS LCD panels to the ramping up of their AMOLED capacity. BOE and Tianma even altered their fab plans, turning newly built facilities initially reserved for LTPS panel production into AMOLED panel fabs. Once the two major panel suppliers finish installing equipment at their respective AMOLED fabs, they will begin trial production sometimes in the second half of this year." Limited supply of LCD panel manufacturing processing equipment and technological hurdles are challenges that later market entrants have to overcome, according to WitsView. The equipment such as the evaporation equipment is supplied by Japanese and South Korean companies. Canon's subsidiary Tokki priortised its supply to Samsung, as per WitsView. "Chinese panel makers will likely build more AMOLED panel fabs in the near term. Costs will not be a significant issue for them because the domestic market has plenty of capital and the government supports the development of new display technologies. On the other hand, AMOLED manufacturing has several difficult technological barriers. In addition to having perfected the backplane production, prospective suppliers have to improve other highly complicated manufacturing processes such as the deposition of the organic layer and encapsulation." suggests WitsView. South Korea’s LG is said to start mass production of flexible AMOLED panels from a Gen-6 fab in the second half of this year.